YES! REALLY free sheet music! A long page of links to music for your piano students, arranged by levels from Beginner to Year Three & After, and categories from Christmas to Valentine's Day! Guitar music for beginners and beyond; mostly with standard notation treble clef above and guitar tablature beneath. Many styles of music to choose from; easy bluegrass to beginning classical! A little bit of opera with standard as well as simplified arrangements, a lot of traditional and folk tunes, quite a bit of Christmas music and hymns, and many lead sheets. All in multiple keys to suit any voice! Lead sheets for all instruments and in many keys, to suit many ranges. Mostly treble clef and frequently with guitar tabs; a few sheets are also in bass clef, and a handful in viola clef. All with suggested chord symbols, and song lyrics! These are great for accompanying your singers. Beginner note-reading help pages, and theory and technique. For guitar, you'll find blank tablature sheets, chords and also chord family fretboard sheets, both GIANT for beginners, and little. Voice teachers will find singing warm ups and vocalises to encourage correct sound production. Many children with autism love music... but they can be a challenge to teach for a teacher who is not prepared. Read about my own experiences and ideas, and what many other teachers have found to work in their own studios! The idea for my own free sheet music site started years ago, when I had trouble finding enough piano music I liked that my students and my own children liked too. Sure, my favorite piano method books had some real gems scattered throughout the pages, but also pieces that kids would drag their way through, getting stuck in for a few weeks. Then, it was always nice to have "extra" or "fun" music to coax them along through the tough times in their piano method books. But sometimes I didn't want to ask parents to spend money on yet another book, when I felt pretty sure only two or three of the pieces in the collection would interest my particular student. Or maybe only one. Parents already paid a lot for lessons... I needed a source for free sheet music! Or perhaps the composition I wanted wasn't available in my student's level...and even if it was, I wouldn't find out in time (think Christmas) because there was -- and still is -- no music store within a hundred miles of my town. Or I might find the piano song they wanted, but the arrangement turned out to be...BORING. Sometimes my students needed lots more practice with the same set of notes, but we had run out of music. Or they were ready to boogie with the 12-bar blues, but they weren't ready to read any of the blues music that I could find. If only free sheet music for kids was available. PRINTABLE sheet music. Printable PIANO music. But it wasn't! ...and I also began to write and arrange piano music for my students, and my own kids. It wasn't exactly free sheet music then, not for me, anyway. Back then, it meant writing out music laboriously by hand on staff paper, then visiting the local copy center. Nothing could be printed at home or at my studio, unfortunately! 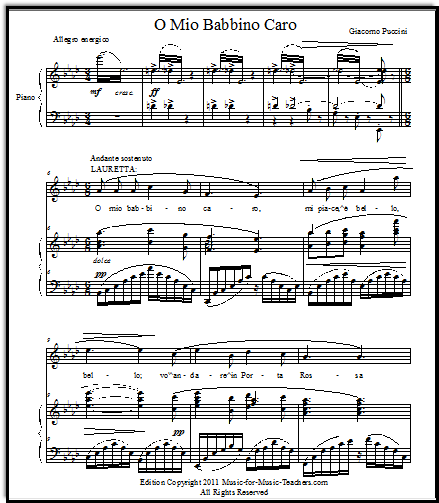 BUT TODAY, WITH A COMPUTER and great music notation software (Finale), sheet music has become a pleasure to write up. WHY GO TO ALL THIS WORK? BECAUSE OF MY STUDENTS. I have one young pianist whose favorite piece was Pachelbel's Canon in D.
I knew he would really go to town if he could attack the Canon, scale passages and all, arranged in the key of C at an appropriate level of difficulty for him... and that is just what happened. SOME OF MY VOCAL STUDENTS LOVE OPERA, but have voices too young and undeveloped to sing the songs in the original keys. With my shorter and lower versions of some classical vocal music, they can still experience the beauty of great vocal music and grow familiar with the classical repertoire, though they are young. 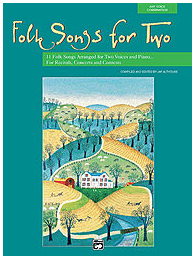 I can also offer them folk and ethnic music that might be impossible to find! AND MY GUITAR STUDENTS NEED EXTRA MATERIAL - beautiful and fun music - to get them out of their one-size-fits-all guitar method books, trying different styles of playing, and learning how chords work. Plus, too many beginner guitar method books start with eighth notes, assuming students can already read music. I want all my students to have a firm foundation of basic counting, and not be guessing when it comes to eighth notes... so we wait awhile on those. NO, I HAVEN'T THROWN OUT THE METHOD BOOKS. They form the backbone of my piano,violin, and guitar lessons. And I buy supplemental books for my students, too. More and more, there are terrific repertoire collections and solos available. Some of them can be previewed online to gauge their suitability for your pupils. I'd like to share my favorites with you. ARE YOU A FULL-TIME TEACHER, A STAY-AT-HOME PARENT making extra money by taking in pupils, or A COLLEGE STUDENT just getting started teaching? Perhaps someone in the family has asked you to give their little girl or boy lessons, and you're not sure how to get started. 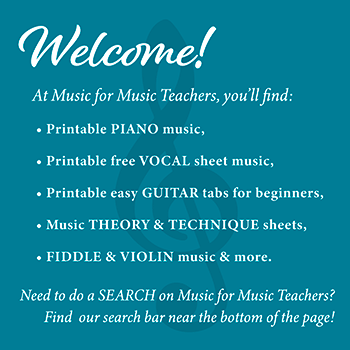 This site is aimed at teachers -- especially BEGINNING MUSIC TEACHERS -- and I want it to become a help in your teaching. 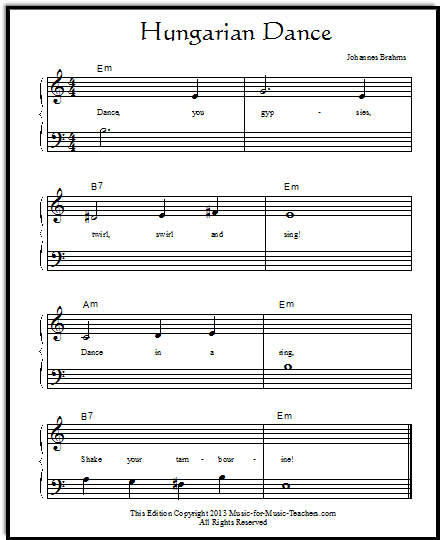 Though my printable sheet music is offered free, it is copyrighted and not for resale. If you want to know when a new page has been added, subscribe to my RSS feed by clicking on the tiny RSS button opposite the title "Recent Articles," below, or subscribe to my monthly-ish newsletter, "Take Note." Thanks for stopping by... please come back again soon to see what new free sheet music has been added!